Stale Gum: The Wal-Mart Chrome Strasburg: Not as scarce as you think. 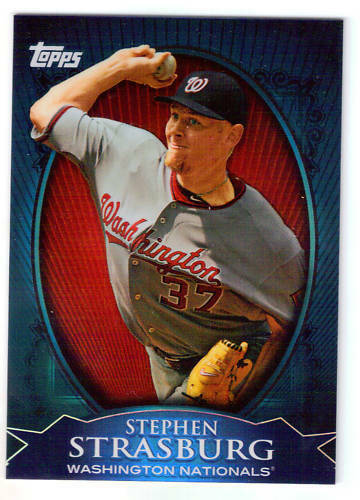 The Wal-Mart Chrome Strasburg: Not as scarce as you think. This is one of three "Wal-Mart Exclusive Chrome" cards available in specially marked "Value Boxes" that were released this week at Wal-Marts nationwide. What collectors may not realize, in their haste for STRASBURG-JO!!! !, is just how not scarce this and the other two cards in the set actually are. 73,150. That's how many copies of each Babe Ruth, Cal Ripken, Jr., and Stephen Strasburg Wal-Mart Exclusive Chrome card were produced. Of course, the cards themselves are not serial-numbered. But, knowingly or unknowingly, Topps gave collectors a clue to their production based on another insert exclusive to the Wal-Mart Value Packs. Armed with this information, and a little algebra, collector's can easily hack the production figures for the Chrome Strasburg. There are 73,150 copies of each Ruth, Ripken, and Strasburg Chrome card. In other words, if you pay more than $5 for any of these cards, you're a damned fool. 219,450/4000=54.8625 per store. I would doubt that each store is getting 50+ of these, so it makes you wonder how many outlets are available for these. I know kmart sometimes carries the Wal-Mart exclusive stuff, and I've found some older Wal-Mart stuff at random places like FYE.